I don't know about you guys, but I have a horrendously long commute. 1.5 - 2 hours each way, every day. I spend a lot of time in my car or on a train and I can only listen to music for so long without feeling like I am going to go insane. That's where podcasts come in. I listen to a range of podcasts, but lately I have been loving those aimed at writing or entrepreneurship. In particular, one of my recent favorites has been Don't Keep Your Day Job . Don't Keep Your Day Job is a weekly podcast hosted and created by Cathy Heller, a freelance songwriter and musician based in LA. This podcast is one of my favorites because Heller gives great motivational pep talks that make you feel like getting out there and doing the damn thing! I know, you're thinking "Could you be any more self-help-y and lame?" Well, yes, but that's not the point. Writing can be lonely work and, when just starting out, it is unlikely that you have a publisher's deadline or an advance check to keep you motivated. 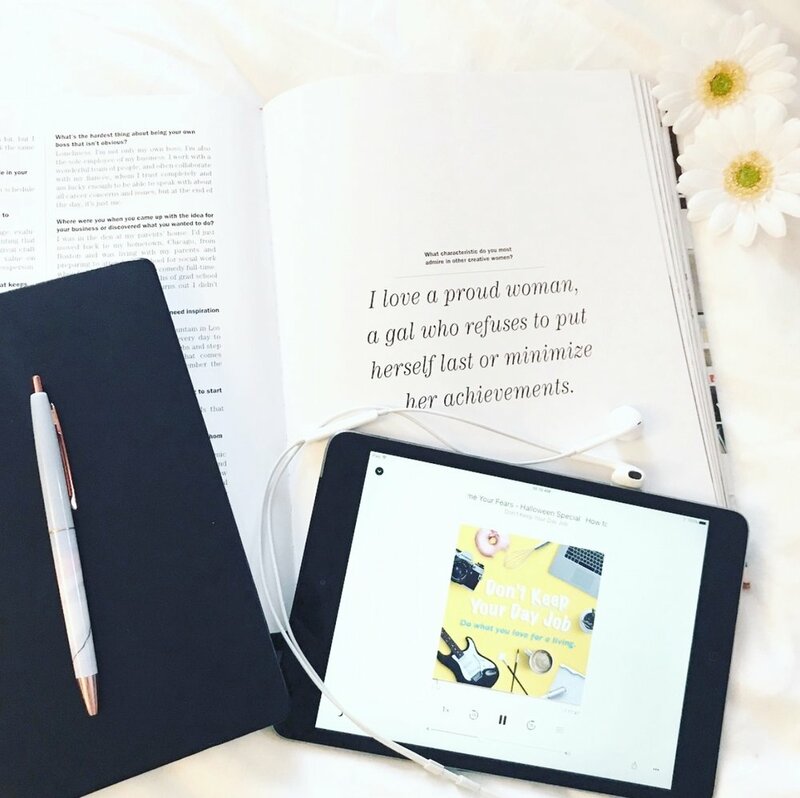 As a new writer, I have to find ways to keep myself tuned in and entrepreneurial blogs and podcast are chock full of motivation. Heller gives a good mix of practical advice on productivity and business development, mixed with interviews and pep talks. Despite what the title may lead you to believe, this podcast isn't about following your dreams and becoming a starving artist. Instead, Heller encourages listeners to find a way to monetize the creative work they are passionate about so that they can do that work full-time. Now, no one is suggesting that writing is a quick way to get rich, but the podcast does offer advice on how to treat your passion project or side hustle seriously and with a business mindset. The entire podcast is great and I have listened to just about every episode. In particular, I think that writers would love episodes "Episode 13: Emily Giffin - How to Write a Bestselling Book" and "Episode 43: How to Overcome Your Fears - Halloween Special". The first is an episode that interviews a successful writer on how she developed her writing career and became a bestselling author. Of course, this is only one person's experience, but I think that it can be encouraging to hear success stories in the writing field. The second episode is more of a pep talk on confronting your fears when it comes to your creative endeavors. While there is no writer-specific advice, I think the general advice of giving yourself permission to fail, to mess up, is incredibly important. Very few writers churn out a bestseller on their first go. I hope that you find this podcast as inspiring and helpful as I have. If you've listened to Don't Keep Your Day Job, let me know which episode was your favorite in the comments below!